#Editor’s Note: The Baked Cat will use “The Board” in place of the actual board name to protect the Anons against shills, attacks, and other ill intentions of division. On Monday, January 8th, 2018, The Board was created on 8chan. The Board is still in use today. Q: The Basics, by Anons was edited, and vetted for accuracy on The Board by the Anons. The Baked Cat (TBC) will not accept any credit for the work these brave, and unyielding Anons have accomplished. Also to refute any preconceived notion or MSM claims about the views, opinions, and other content of TBC associated with the Anons. The Anons are not responsible for the content of TBC. TBC is a free for all to ideas, information, and entertainment. I don’t want your money, I want people to wake up. To think for themselves, to teach others, and laugh at differences rather than live in fear of them. I stand behind these Anons 100%. Truth IS important. This is why we wanted to help get the Anons message to the public. So you, THE PEOPLE, can learn the truth. Straight from the Anons sources, rather than, be lied to by the media. All credit belongs to the Anons of The Board, and Q, for their work, their dedication, and for their movement: A movement created by the people, slandered by the media. Harsh words have been cast against innocent people, it would be truly unfair to let it slide without allowing for a rebuttal. These Anons work tirelessly to dig to the bottom of every last crumb in search of the truth. These Anons are doing this without pay, and many times have, at times, suffered set-backs or even loss as a result of their efforts. Still they fight. They are true patriots. The MSM will never report the truth. Fake news has so long been a tool of lies and division. These Anons have sent the MSM into panic mode, but more importantly, they have brought the people of the World closer together. Each day, worldwide, these Patriots fight! Check out qanon.app, qmap.pub, qanon.news, qanonmap.bitbucket.io to learn more. Learn a little truth for yourself, find out what the MSM is too scared to tell you. Below in text format is Q: The Basics, by Anons, I have included screenshots of Q’s posts linked to their source on qanon.app, as a visual guide to what the Anons are discussing. Moar sharable content listed at the bottom of the page. 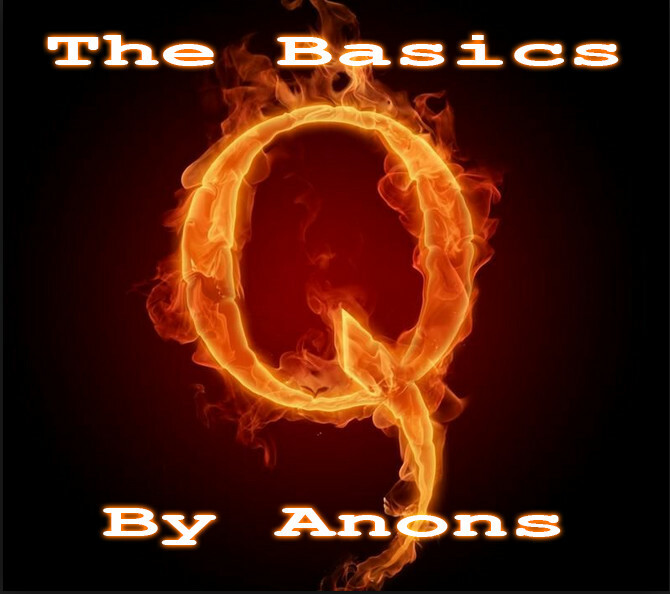 All credit belongs to the Anons of The Board and Q.
Qanon, or Q, the eponymous and anonymous poster who has gained a considerable amount of attention over the past several weeks, is now being discussed by both Mainstream Media (MSM) and mainstream America alike. While the MSM had previously published a negligible number of stories about Q, a notable increase in the obviously coordinated number of articles has occurred since President Trump’s rally in Tampa Bay on July 31st, 2018, where sightings of “Q” t-shirts and hand-made posters were not only ubiquitous but their presence was even acknowledged by the President himself, gesturing on live TV. The time has now come for an informative introduction intended to educate those who are unaware of, interested in, or just beginning to follow Q, and to refute the misinformation, disinformation, and fake news being propagated by the liberal MSM, and even by several purportedly conservative (and supposedly Trump-supporting) media voices on the subject. And who better to describe and explain the Q phenomenon than the “anons” themselves, the anonymous posters who follow and converse with Q? To this end, this introduction is not meant to explain all that Q has stated in the information and intel posted (known as crumbs, an allusion to bread crumbs); it will cover just the basics. 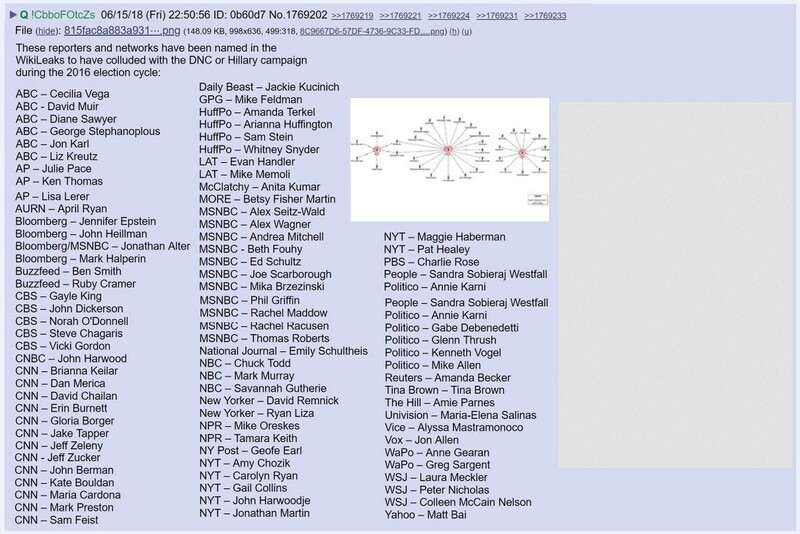 For more details on what Q has communicated, the reader should to go to sites like qanon.app, qmap.pub, qproofs.com, qanon.news, and other similar sites that compile crumbs, side by sides (side-by-side graphics confirming intel through open-source reporting), and proofs (graphics showing that coincidences mentioned by Q are not coincidences at all). 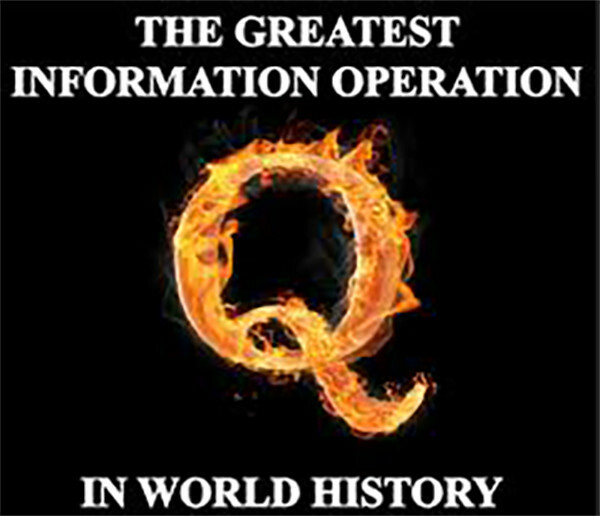 Neither Q nor the Great Awakening “movement” associated with Q are conspiracy theories, but rather an organic information operation and truth-seeking campaign, the goal of which is to help President Trump peacefully Make America Great Again, and by extension to make the world a better, safer place for all to live in peace. So, in order to be properly introduced to Q, and to the movement associated with Q called the Great Awakening, there are questions the reader will need answered: Where and when did Q start to post? Who posts as Q? What does Q post about? Why does Q post? II. WHERE AND WHEN DID Q START TO POST? The first crumb Q posted was on 4chan, an image board Internet forum launched in 2003. Q first posted in the thread named “Mueller Investigation” on the board named /pol/ on October 28th, 2017, and on other threads until, on October 31st, 2017, Q then posted in the thread named “Bread Crumbs – Q Clearance Patriot”. On November 1st, 2017, the thread “Calm Before the Storm” (CBTS), named after President Trump’s perplexing phrase uttered on October 5th, 2017, was created. Q posted on multiple iterations of CBTS (536 threads) until stating that 4chan had been infiltrated and security compromised, necessitating a move to 8chan in order to maintain readers’ assurance of Q’s authenticity. 8chan, a non-affiliated image board similar to 4chan, was launched in 2013 as a free-speech alternative to the increasing censorship at 4chan. A board was created with the same name as the thread Q posted in on 4chan, /cbts/, on November 19th, 2017. Q posted on /cbts/ until January 6th, 2018 (308 total general threads), stating that that board had also been compromised. Q had problems using the tripcode, a pseudo-registration that verifies a poster’s identity, notably on December 14th and 21st, 2017, among other instances. This inability to use the tripcode forced anons to make a new board: /thestorm/. Q first posted on /thestorm/ on January 5th, 2018. Q and anons stopped using /thestorm/ after 41 general threads due to internal disputes and self-promotion, forcing a migration to yet another new board. Then, on Monday, January 8th, 2018, the board still in use today was created, named /qresearch/, which will henceforth be referred to as “The Board”. Q has been able to post freely on The Board since that date, and continues to post crumbs up to the time this was written. Also on January 8th, 2018, Q made a private board for Q alone to post in, named /greatawakening/. On March 28th, 2018, Q stopped using /greatawakening/, stating that it was under attack. Finally, after a delay, Q made /patriotsfight/ on May 4th, 2018, the private board that Q uses today. On all these boards, Q has posted crumbs that anons can discuss on /qresearch/ with Q, although those who are new to The Board are encouraged to first observe how anons operate and research before contributing. However, it should be noted that there are no communications outside these boards or with anyone privately and, as Q has stated, anyone claiming otherwise, “should be considered fake news and disregarded immediately”! Since the MSM has yet to accurately describe how The Board actually works, some clarification is in order. 8chan is maintained by the Code Monkey (CM), which hosts The Board. The Board Owner (BO) maintains The Board, appointing Board Volunteers (BV) to help. 8chan has a maximum limit of 751 for the number of posts in each thread. So, to maintain the research done by anons in the general thread, an anon must make (bake) a new thread (bread) each time a thread reaches 751 posts. This anon is known as “the Baker”. The Bakers are responsible for posting Q’s recent crumbs, notable posts of research from the previous thread (notables), and other information and links used by anons (dough) as the first posts in the new thread. Besides the General Research thread, The Board has other threads, maintained by the BO and BVs, for memes, side by sides, and other research topics. Those who attempt to disrupt, discredit, or distract anons from doing and discussing research on The Board are referred to as “clowns” or “shills”. The anons themselves come from many countries, occupational backgrounds, and stages of life, working cooperatively (“the Hivemind”) to attempt to better understand the truth behind historical and current events. Q may post several times a day for weeks or, conversely, not post for days or weeks at a time. To date, there have been more than three million posts on The Board, and Q has dropped over 2000 crumbs, reaching an audience of tens of millions in the United States of America and around the world. III. WHO POSTS AS Q? While Q posts anonymously, there have been hints as to just who Q might be. The signoff as “Q” in most crumbs began in a post on November 2nd, 2017. Before this date, Q had already introduced the concept of being a “Q Clearance Patriot”. “Q Clearance” is a Department of Energy security clearance designation for someone who has access to Top Secret, Secret, and Formerly Restricted Data, in addition to National Security Information. This clearance is similar to the Top Secret clearance in the Department of Defense. It is important to note, however, that Q never claims to have this specific clearance, nor to work for the Department of Energy. It is an allusion. 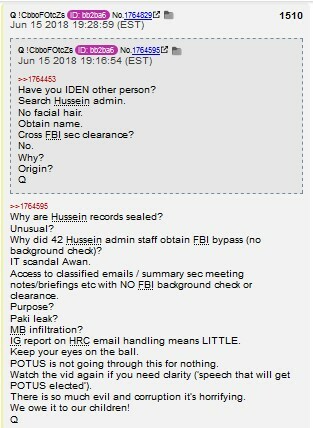 The “Q Clearance” simply signifies that Q has a high level clearance designation, and alludes to the “Q Clearance” given to Jack Ryan in The Hunt for Red October wherein he did not have the necessary clearance to help in the search for the rogue submarine. The “Q Clearance” allusion is simply meant to imply that Q has the necessary security clearance to be cryptically divulging insider information without leaking, thus maintaining national security. Q’s use of allusions from popular culture has a dual purpose: not only to maintain national security, but also as a foil to expose, mirror and thus counter the media and entertainment industries’ deliberate development of popular culture into a propaganda arm of those who advance their own agenda and, in so doing, would do us all harm. Q has also posted under other signoffs: “The WH”, “4,10,20”, “Q+”, “Q, DELTA”, and “Q [auth478-24zgP]”. Occasionally Q does not use a signoff, yet anons know that it is Q due to the tripcode used. While there are unconfirmed theories about the meaning of each of these signoffs, individuals are encouraged to see the signoffs within the context of the specific posts where they appear and to draw their own conclusions. Q has stated that, “We serve at the pleasure of the President”, implying not only that Q works for President Trump, but also that Q is a team. Early on, Q used “I” a few times, but now only uses “we”. On occasion, Q posts pictures of the President’s pen and signatures, scenes from Air Force One while the President is traveling, and other images and crumbs that also imply that Q is close to the President. Q has also affirmed that, “Less than 10 can confirm [who or what Q is]”, adding, “Only three are non-military.” It should be noted that the anons on The Board are encouraged not to try to “dox”, or identify, who Q is. The understanding, then, is that Q is a team of high-ranking officials within the Trump Administration who post information to awaken the public to sensitive and important events or “happenings” that the media may or may not report on, and to provide insider context. While fewer than 10 people can confirm Q’s identity, it is widely thought that there are multiple people who post as Q. Due to the fact, therefore, that anons do not know whether Q is one person or several when posting, it is common to refer to Q as a collective singular noun. 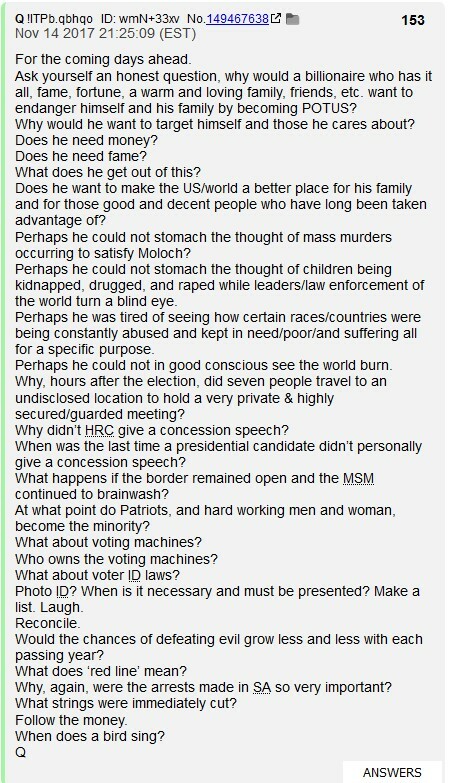 Whoever Q might be, pictures are posted that point to a connection between Q and the President, and posts are written in real time about policies advocated by President Trump, events in which he takes part, and strategies he deploys. Also in real time, anons decode Q’s cryptic messages to attempt to better understand what President Trump’s intentions were for a specific policy or event. While the public awaits the revelation of who posts as Q, anons were given this on March 10th, 2018 in reference to Q’s identity: “How many coincidences before it becomes mathematically impossible? Wait until you learn who has been talking to you here.” Q’s specifically confirmed identity might remain a mystery to anons and to the public, but ultimately that is not important. It is, rather, the messages, information, intel, and facts that Q posts which are important. 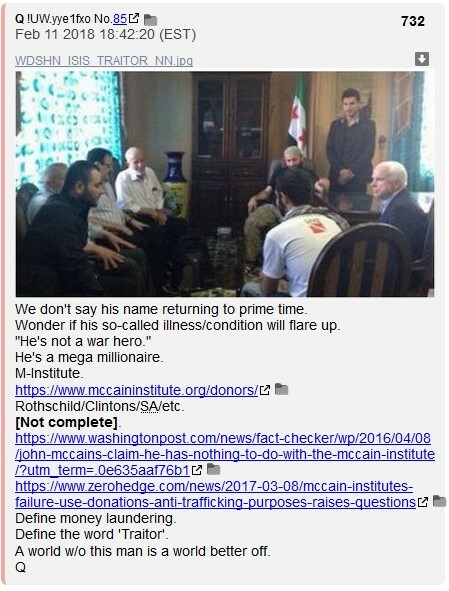 Anons focus not on who Q is, but on what Q is saying. The intel decoded from the crumbs gives anons, and the public thereafter, what appears to be insider information on what President Trump’s administration has done, is doing, and will do. IV. WHAT DOES Q POST ABOUT? 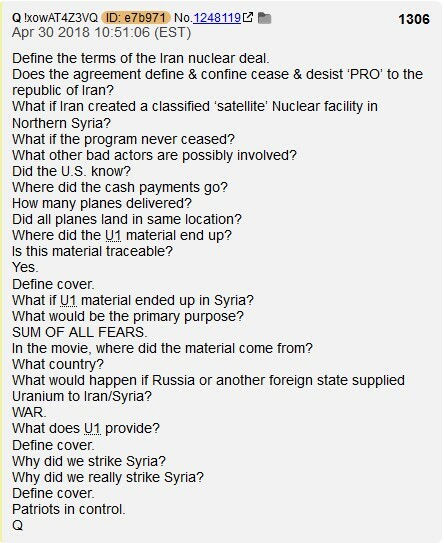 Starting from Q’s first crumb, there have been cryptically worded statements and questions that are meant to lead anons and the public to question and research insider information about presidential strategies, policies, and events. These details have been and will continue to be provided without violating National Security (NATSEC) and Operational Security (OPSEC) laws, to ensure that there is no leaking or divulging of secret or classified information. This intel is focused on what President Trump has faced, is facing, and will face as the leader of the free world: corruption, subversion, sedition, and evil. The President is fighting for “We The People” of America, the public citizenry, and, ultimately, the world. Ongoing or upcoming events in this fight are alluded to in cryptic phrases that Q uses called “signatures”. Signatures such as “Alice and Wonderland” (not to be confused with just “Alice”), “Sum of all Fears”, “Hunt for Red October”, and others are meant to allude to an event that cannot be explained at the time that the signature is used. Q also uses “stringers” that are important and puzzling strings of words, numbers, letters, and symbols that are meant to convey more sensitive information. As an example of what stringers are, Q posted this within a series of stringers on November 25th, 2017: “_FREEDOM-_v05_yes_27-1_z”. Those who are interested in such details are encouraged to research and learn for themselves what these crumbs imply and to draw their own conclusions by viewing crumbs and side by sides in the websites listed in the introduction. 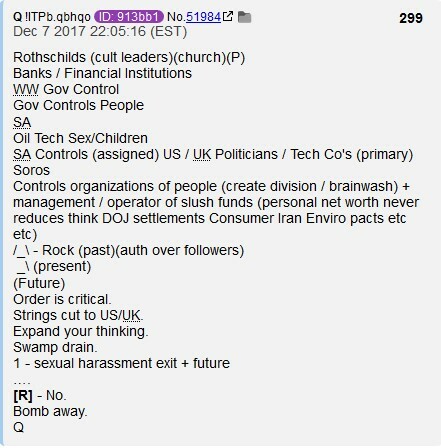 Detailed crumbs aside, Q started with a macroscopic overview of the nature and structure of the current “World Order”, which President Trump was elected to confront and change for We The People. Q has overtly stated that three “puppet masters” exert a degree of power in the world that defies credulity: The House of Saud, the Rothschild family, and George Soros, each having their own sources of financing and control mechanisms. For example, we know that the House of Saud, the dynastic monarchy of Saudi Arabia, has amassed trillions of dollars from oil exports and that subsequent Saudi Arabian influence across the Sunni Arab world has resulted in the funding of radical Islamic terrorist groups and malicious political influence in the West. Thankfully, because of allies in Saudi Arabia and President Trump’s diplomacy, Saudi Arabia has been largely removed from this power structure. The Rothschild family has also attained trillions of dollars in wealth through their banking and other financial endeavors undertaken over the span of centuries. Their control over central banking, wars, and governments has enabled them to dictate policies, laws, and the actions of politicians in many, if not most, nations. Then there is George Soros who, with likely an undeclared fortune of around one trillion dollars, has been able to control markets, influence many politicians, and lobby governments through his extensive apparatus of subversive political organizations. Moreover, Q has stated that Soros has taken the place that the Rockefeller family previously held in this World Order. Many of Q’s first crumbs explained aspects of the control exerted on We The People by these three “puppet masters” and those that work with or for them. This worldwide power structure, known as “the Cabal”, along with the compromised monarchies, politicians, governmental agencies (the Deep State), corporations, charities, media organizations, and other private individuals is what President Trump is fighting. This same Cabal of corrupt and truly evil individuals is what was fighting to prevent President Trump, and We The People, from winning in the 2016 election, and it has been fighting those election results ever since. In fact, as Q has repeatedly stated, “They never thought she [Hillary Clinton] would lose.” Upon her presumed victory, for which the Cabal so spectacularly unsuccessfully fought, the Cabal would have continued unimpeded and increased its illegitimate control over the world and its people. In fact, as is becoming increasingly clear, the Cabal did everything they could to get her elected: the financiers spending billions of dollars, media organizations lying, Deep State actors within government agencies leaking, and even spying on President Trump as a candidate, president-elect, and President, to no avail. After macroscopically describing the Cabal’s operations and machinations, Q’s crumbs then began focusing in more detail on all the Cabal has done, is doing, and likely will try to do. Discussion of the spying on President Trump and his campaign is but one example of how Q focuses microcosmically on events. This is done by asking detailed questions about how, for instance, the CIA, FBI, DNI, Five Eye [Australia, Canada, New Zealand, UK, and USA] Alliance, Republicans, Democrats, former President Barack Hussein Obama and his White House, and others appear to have themselves colluded to abuse the FISA process with a fake “dossier” to illegally spy on President Trump’s campaign using “plants” and spies. Pre-empting the public exposure of their crimes, they have been unsuccessfully attempting to frame President Trump through projection with allegations of “collusion” with Russia for the “hacking” of emails from Hillary, the DNC, John Podesta, and others. A wide range of other topics, events, and scandals are covered in the over 2000 crumbs dropped without leaking or breaking national security laws. This includes coverage of the following: government agencies such as the CIA, DNI, FBI, DOJ, and others; globalism; mass migration; cultural Marxism; human trafficking; the Clinton Foundation; Uranium One; WikiLeaks; Seth Rich; Jeff Sessions, Robert Mueller; John Huber; many discredited officials from Obama’s presidency; President Trump’s strategies and executive orders; media corruption; illegal spying on citizens; infiltrations of the United States government by foreign bad actors; extremist organizations such as MS-13, ISIS, and Antifa; political subversion by the Cabal and their politicians; foreign policy strategies on North Korea and Iran; and much more. Through open-source research generated by this information, Q aims to reveal who controls the world, how they control it, and what is being done to stop this control. We The People of the United States of America elected President Trump to fight against this control, as our representative, but he is not entirely alone. There are many Patriots who were and who are helping the President in this fight. If Q serves the President, and he serves We The People, then Q and the President serve We The People together. And together, We The People need to know just what it is that we are fighting against so that we can know how to fight for our common good, for “Where we go one, we go all.” This enlightenment of the public consciousness and conscience, not just in America, but worldwide, is known as the Great Awakening. This “awakening” occurs when anons decode and decipher the meanings of crumbs and disseminate them to the rest of the public. The timing of when the crumbs are posted is important to the decoding of Q’s communications. Yet, whether the crumbs come before or after the events they describe, they nonetheless allow anons to convey the insider information to the public in order to educate and awaken those who do not know or understand the reality behind events experienced or narrated. Anons create memes to make this message easier to understand, side by sides to show through open-source reporting what the crumbs mean, and proofs to show Q and President Trump’s connections and similar thought processes. No one is forcing anons to decode the crumbs, to research, make graphics, or spread the information to the public. The intel contained in the crumbs is revealing, informative, and educational, and anons understand it is for the good of the country and the world that the public have access to this information – after all, it affects them regardless. Millions have already been reached, and millions more will be in the future. Q’s posts have shown these millions what the Cabal has been doing, who is in the Cabal and how the Cabal has been controlling the world. Yet with each revelation to the public, the control by the Cabal over humanity decreases, day by day, post by post. V. WHY DOES Q POST? Q first used the term “Great Awakening” on the second day of posting, October 29th, 2017, and has used it many times since. On January 8th, 2018, Q first used the phrase, “Where we go one, we go all” (WWG1WGA). Q has used many other phrases, including “Truth belongs to the people”, “The choice to know will ultimately be yours”, “Expand your thinking”, “Dark to light”, “You are not alone in this fight”, “Good will always defeat evil”, “Future proves past”, “Read the Bible. God Wins”, “You are the calm before and during the storm”, and many others. 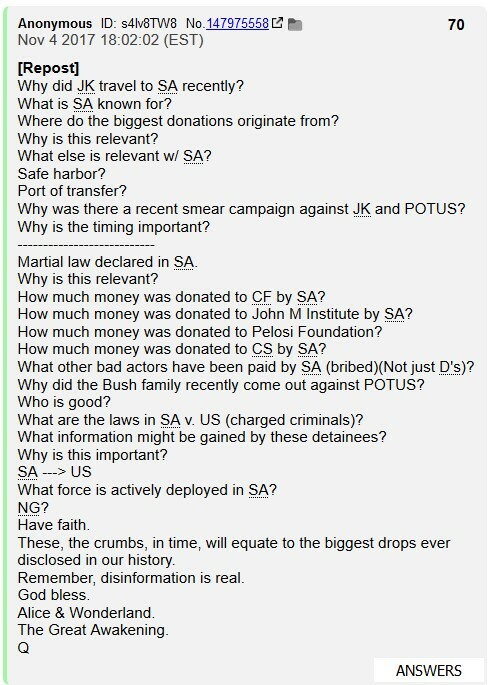 These phrases signal – to the anons that decode, research, and spread the crumbs, and to the public as well – that we can help President Trump fight the Cabal by educating others about what it is that we are fighting. Q reminds anons and the public that this fight’s, “Scope and size [is the] biggest in history”, to “Trust the Plan”, and to “Stay the course.” The Plan to fight the Cabal was initiated by Patriots, and Patriots were, are, and will be helping the President execute it. The Great Awakening is not a conspiracy theory or a cult, as those who seek to discredit would like the public to think. It is a sophisticated and coordinated information operation from within President Trump’s administration to enlighten the public about the true state of affairs of the nation and the world, providing vast amounts of information well beyond the scope of this introduction. So vast in fact, that Q has stated, “These, the crumbs, in time, will equate to the biggest drops ever disclosed in our history.” Ultimately an informed public is a key component of Making America Great Again and Keeping America Great. The Declaration of Independence that led to the founding of the great Nation that is the United States of America states that, “Whenever any Form of Government becomes destructive of these ends, it is the Right of the People to alter or to abolish it, and to institute new Government” and such is relevant today. We The American People acted in accordance with this ideal by electing President Trump to renew our government, and Q, through the Great Awakening, is enlightening We The People about what the enemies of the people have done, are doing, and will do to fight this historic change. The intensification of attacks against Q, the Great Awakening, We The People, Patriots, the President, and the United States of America is indicative of the ferocious level of resistance to the loss of power and control of those whose deeds and true objectives are being exposed. 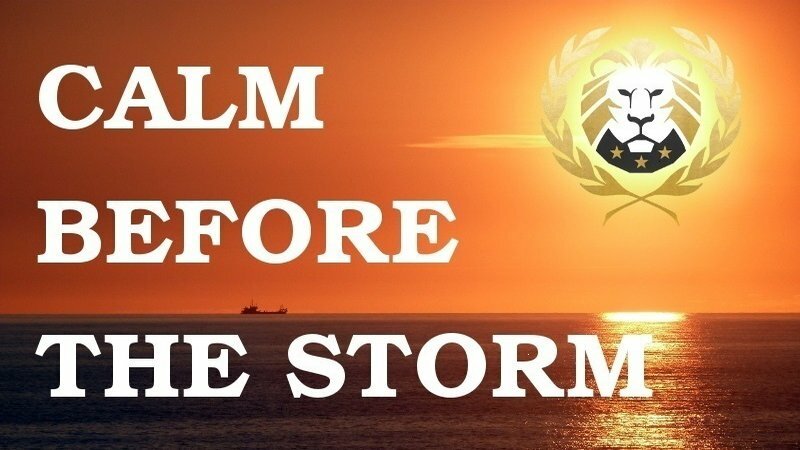 In order to mitigate the confusion in this time of chaos, Q has asked anons to help be the Calm Before and During The Storm. To this end, Q also asks anons and all those who have been preyed upon, to pray. God bless the Nations of the World, and God bless a World of Nations. God bless all Patriots, President Trump, and the United States of America.